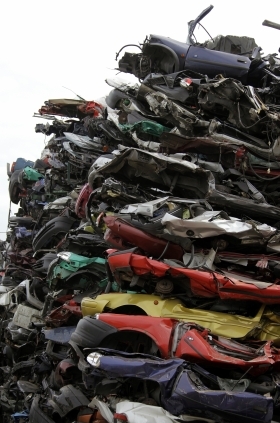 Scrappage bonuses helped UK sales to rise 31.6% in Oct. The UK's scrappage incentive doesn't appear to be helping the country's domestic car producers as many buyers are using the bonus to buy foreign-made models. While British new-car sales rose 31.6 percent to 168,942 last month compared with the year before, local car production fell 6.7 percent, according to Society of Motor Manufacturers and Traders figures released Friday. The British government introduced a scrappage scheme earlier this year that gives drivers 2,000 pounds ($1,600) to trade in cars more than 10 years old against a more fuel-efficient new model. The incentive has proved popular but domestic production has remains weak as many Britons have chosen to trade in their old vehicles for foreign-built models. For the year to date, car production was 38.1 percent lower than a year ago. The October decline was the smallest monthly drop this year. Paul Everitt, SMMT CEO, said he was cheered by signs that the world economy was pulling out of recession but said next year would remain challenging. "The scrappage scheme and early signs of recovery in global markets offer some encouragement to UK vehicle producers, but 2010 is expected to be another difficult year for the industry." The UK has no locally owned volume car manufacturer but Nissan, Toyota, Honda, BMW and General Motors Co.'s Vauxhall unit all produce cars in the UK. The production of commercial vehicles has been particularly hard hit by the economic downturn, falling 60 percent in the year-to-date.